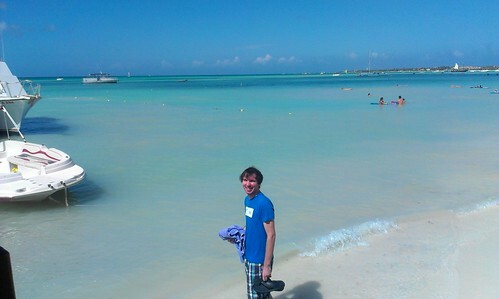 I went to Aruba to celebrate New Year’s with friends. Chris had spotted tickets on AirTran for $600 in June and we thought it was a great deal so we booked immediately. He then found a house on AirBNB that we rented for a week. The group was Chris, Erin, Dave, Pinguino, Craig, Erik, and me. We went snorkeling, visited caves, and participated in the Aruban tradition of buying way too many fireworks. You can find many more photos from the trip on Flickr including me harvesting a coconut found in the backyard. I’ve managed to celebrate New Year’s Eve with Dave and Pinguino every year since moving to LA: 2008 was at CCC in Berlin; 2009 was Fakearctica camping at Lake Isabella; 2010 was Prommunism in Seattle with Jo; 2011 was Breakfast of Champions in San Francisco.